I’m kind of over the whole zombie thing. Over the last few years people have gone a little zombie crazy and the market is well beyond saturation at this point. Also, I was not particularly thrilled to find out that this movie was basically World War Z in name only. I am a huge fan of the book and had really been looking forward to seeing it made for the big screen. 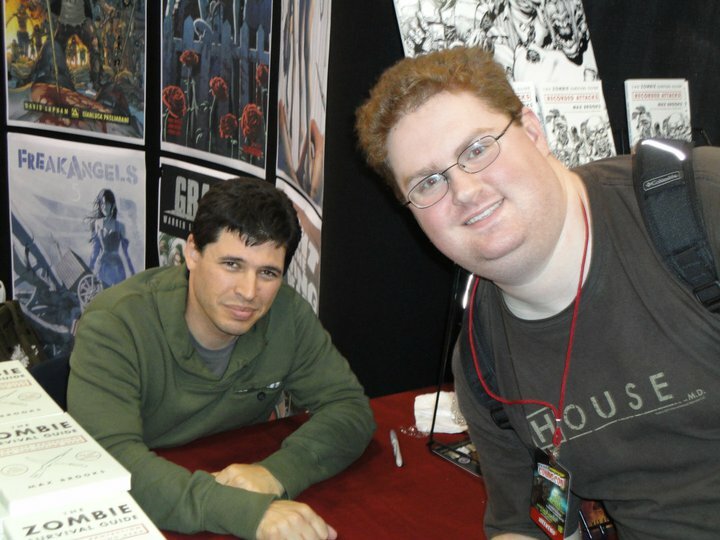 My enthusiasm quickly faded a few days ago when I came across an interview with author Max Brooks. Brooks, son of comedy genius Mel Brooks and actress Anne Bancroft, is no stranger to Hollywood and was well aware that his novel wouldn’t make it to the screen intact. In the interview Brooks said that people should see the movie and judge it strictly as a movie. While not going so far as to endorse the film, Brooks made a very good point by telling people to evaluate it on its own merit. I knew there was a very real chance that even though this movie was not going to be the book brought to life, it could still be a pretty good story in its own right. And so with that thought in mind, I went forth and saw World War Z. As it turns out, World War Z is a pretty solid action flick. It is most definitely not the book, but that is okay. A few elements from the book were introduced to give the movie a similar feel, but I don’t really think those were necessary. The main character Gerry Lane, played by Brad Pitt, is a former UN investigator who is trying to figure out how and where the “zombie” plague began in exchange for his family’s safety onboard a US Navy ship. I use quotes for “zombie” because the characters in the movie, like those in the book, acknowledge how ridiculous mythical zombies are and use the word only to describe the virus in terms that are easily understandable. Lane’s search takes him on an impressive tour of much of the globe, hitting South Korea, Israel, Wales, and Nova Scotia. Viewers are treated to some stupendous aerial and wide angle shots of the surrounding scenery (albeit, usually covered with the stumbling infected). Interspersed among these great shots are some pretty standard, though well-crafted, action sequences. Since this is a zombie movie, there are plenty of escape scenes and crowd chases, but none of these feel tired or played out, as can often be the case in this genre. I really appreciated the fact that the film got off to a quick start, giving a brief introduction to the characters and then rolling right into the action. I absolutely hate when a movie takes forty-five minutes to get finally get to the real heart of the plot and then rushes through it to get to some massive climax. Often times what makes or breaks a movie like this is the acting. Aside from Pitt, there weren’t any other big name actors I recognized, but everyone gave a consistent performance across the board. A big film with plenty of money to spend on effects rarely fails because of the visuals, and a big name, leading actor can only lift the movie so much, so it comes down to the supporting cast to either keep the film afloat, or torpedo it. The only two really standout performances were by actors playing zombies towards the conclusion. Both play mindless, spastic undead wonderfully, and give them disturbed personalities of their own. From bugged-eyed head banging to chattering teeth and dog-like sniffing, they make it truly believable that these creatures, though once human, are now something entirely different. 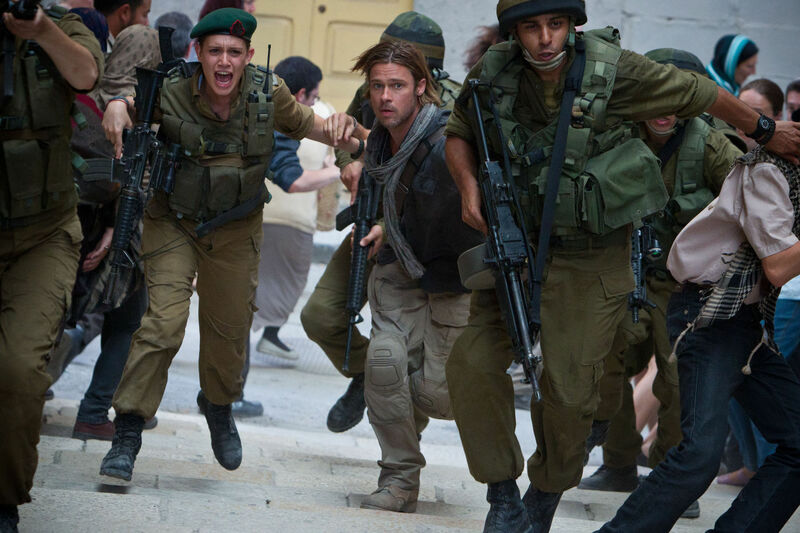 Whenever Brad Pitt starts running around with the supporting cast, bad things are about to happen. There are some things that were included that I could have really done without. First on that list, and probably the ones I find most annoying, are the quick cuts through file footage of riots, wars, natural disasters and the like that start off the movie; and the similarly cut, faux news reports of people fighting back and receiving aid that wraps up the film. This has been done so many times it honestly makes me want to hurl. I get what the filmmakers are trying to accomplish but it is cliché and the time for new material has come. I was also turned off by how fast those who had been bitten turned into zombies. I think that much of the terror and suspense of a zombie film comes from the impending transformation. Every time somebody gets bitten it is understood that before long they will be joining the ranks of the undead, but that it will be a slow and horrifying process. Just thinking about it makes the skin crawl. In World War Z, the whole process from bite to full on zombie takes ten to twelve second. The virus acts unrealistically rapidly, even faster than almost any kind of venom, poison or nerve agent in real life. This removes almost any believability from the transformation which doesn’t have much to start with. My final complaint about the movie concerns the PG-13 rating. I have nothing against the film having a PG-13 rating, but in order to get this rating, the film makers seriously cut back the on-screen violence. This led to a few shots that reminded me of R movies that have been cut so they could be shown on cable. What is happening just off screen is obvious and the attempts to avoid showing it just seem awkward. The movie ends as many zombie movies end: open to glimmers of hope. I have yet to hear of a World War Z sequel and while there is room for it if they’d like to do one, the fact that the film was wrapped up enough to stand on its own pleased me. 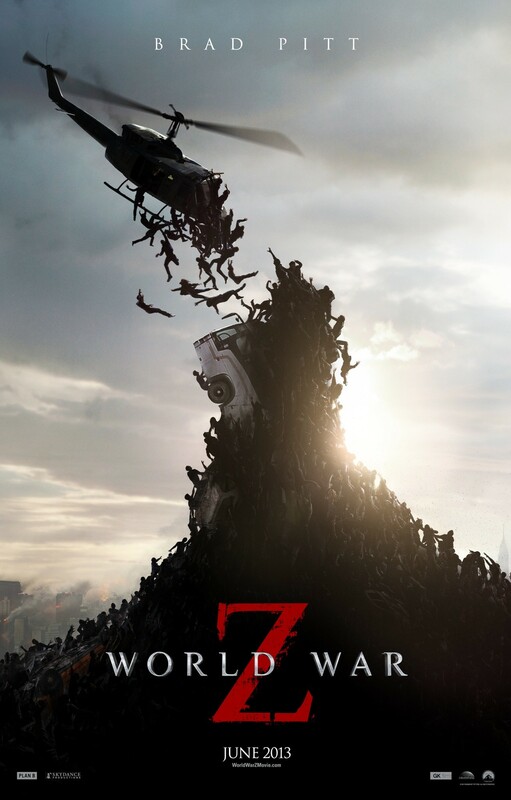 While World War Z may not be rated among 2013’s greatest movies, it was certainly a strong addition to a genre that often fails to change or adapt and frequently feels played out. There is a real chance that diehard fans of the book will be disappointed if they are unwilling to take the advice of author Max Brooks and judge the movie on its own merits. As for the rest of us, it’s worth checking out. World War Z has earned itself a solid 3 Death Stars. While this ending sounds pretty Badass, I’m quite happy with the one that made it into the film.